Add 2 Windsocks to Cart, Get $1 Off each! I have bought these for years to hang from our front porch. They are one of my favorite items. I buy several at a time. As the weather takes its toll, they have to be replaced. Could not be more pleased with my patriotic Windsock. How much do I love my freedom , The answer my friend is blowing in the wind. All my neighbors had to have one. It will be used to judge wind direction at a Remote Control Air Field, at Panama City Beach, Fl. The windsock is larger than any I have found in stores and very pretty. Windsocks are not only attractive in the literal sense but as patriotic "standout" attractiveness, they also serve to add a "current windspeed and direction" feature to the mix, a feature not lost to the well informed homeowner. The colors are great. Wow. We love the swivel hook and the workmanship looks very good. Only time will tell how it holds up in the sun. 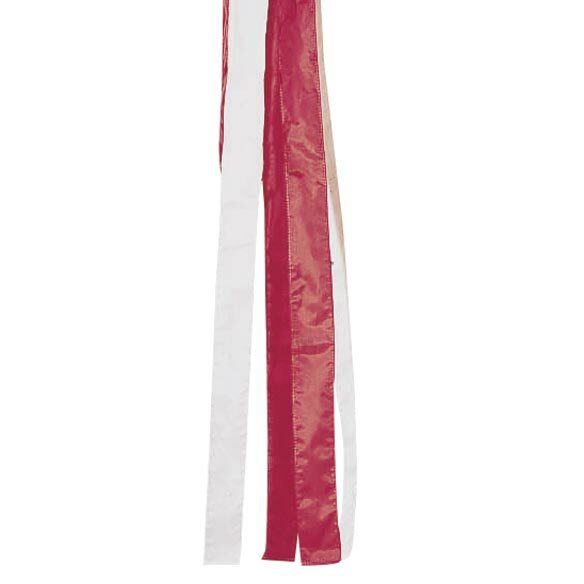 Patriotic Windsocks are Great Holiday decorations!! 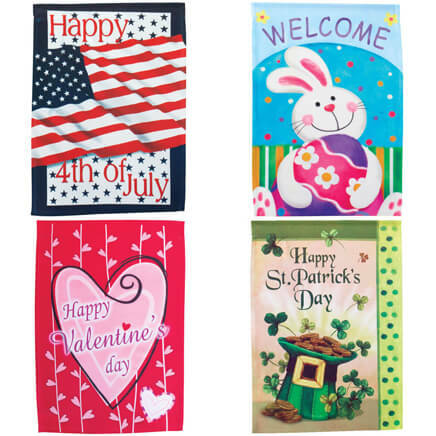 I have used these colorful Patriotic Windsocks for many years. I love to decorate for my 4th of July Party! They lasted 4+ years. Great Bargain! If you buy more than 1 at a time...they take money off. Bought these for my sister. She loves them and won't buy any others. It works perfect hanging on my front porch. I like the fact that its patrotic colors and love to have it out for the 4th of July and the rest of the year. I have the Rainbow Wind Sock up now and it looks real good! I also got the patrotic Stars and Stripes to put up for patriotic holidays like Memorial Day, 4th of July etc. The patriotic windsock is wonderful. As noted I have hung it on the front porch so all that drive by can see it. It is easy to hang and it flows with the wind. Very Pretty. Thankyou for getting it to me before the 4th of July. I love the wind socks. They are colorful and made very well. I always have one on the deck and so bought several so if one wears out I will have another. I just love them. I hung it on my front porch so everyone can see it the colors are bright love it. I love it! Would by it again. What can't be greater then a red, white and blue wind sock! It's the flag and sock rolled into one. This was allowed when I lived in Galveston & the apartment complex would not allow me to fly the flag, an important part of my life since my husband (a 'Nam vet) passed away. He always wanted a flag to fly in front of his door! These are perfect for my use. Connected to an adjustable 'pool cleaning' pole on my fence. Yes I would certainly buy it again. I have this patriotic flag windsock hanging from underneath the roof of my apartment, & it is close to my door where people enter. It is a very nice nylon fabric. On a nice windy day you can see the beauty of it blowing in the breeze. I am happy with the purchase of it & the price is very affordable. A.G. Proud to be an American. Show it in any way one can. I am a veteran and fly my flag daily. I have attached the windsock to the edge of the center ridge pole of the house where it catches the wind quite nicely. I fly 2 of these windsocks all summer on my boat docks. They last 1 summer if left out all the time and at least 2 summers if we bring them in when nobody is at the river lot. I always buy the patriotic windsocks and will continue to do so. And the price hasn't gone up since I started buying them several years ago! I haven't put this one up yet because I am waiting for July 4th holiday. But if it is anything like the other 2 windsocks I recently bought with it, then it will be fantastic! The tails are very long and when the wind catches them, they fly out and up. Buy several to perk up your yard. The colors are vibrant and so patriotic. Happy to find at a reasonable price, because the worn-ou one needs to be replaced. Colorful patriotic means of displaying patriotism. We live on a ranch, and wind direction and velocity are important to us, in the event we have to spray for weeds, etc. I have kept these windsocks up for over 30 years, and this is the best place to get them from, so when one wears out from use, I order two more. This is very long. We put it on the top eave of the house porch and the wind blows it so nicely. This is the first wind sock I've ever own that I liked this well. I especially like that is the design of the United States of America flag. I fly this one year round. I always order my windsocks from Miles Kimball, and fly them every day. They last a long time, and keep their color. I love them. My next door condo neighbor flys her flag...when I used to fly mine it looked like "double flags"..kinda much...now windsock shows patriatism but is different...also windsock does not disturb hanging plants as much! We use the wind socks to help keep the birds away from our pool, and they work great! We've tried other wind socks, but these are the best quality for the price. My father-in-law got me started on this and it's in his honor that we continue!!!! 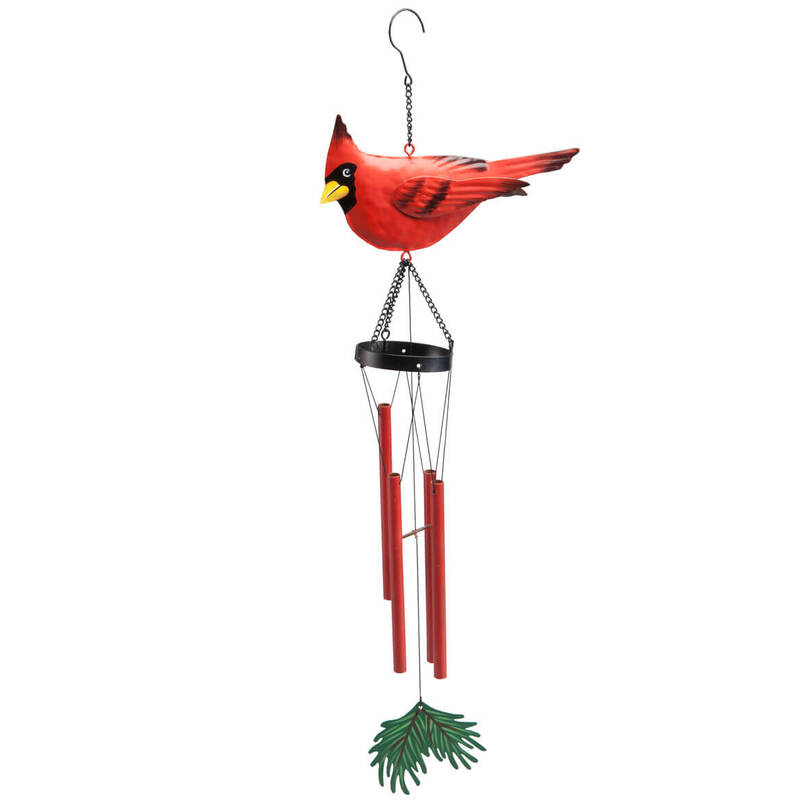 I use this on my patio for decoration and it also helps keep the birds from roosting on my patio. I've been buying the patriotic and rainbow windsocks for my parents for years and they love them. They live semi-rural, put the windsock at the top of a long pole and actually use it as a windsock - watching which way the wind blows! i use this to hang on my rv.Proud of my country. I order all of these windsocks from Walter Drake and have used them for a long time. I couldn't find them any where else and Walter Drake had it. Last along time!! This windsock is well constructed. It has been hanging on my sunny porch for the past six months. There has been only a little fading and the edges have not frayed through the strongest winds during thunderstorms. 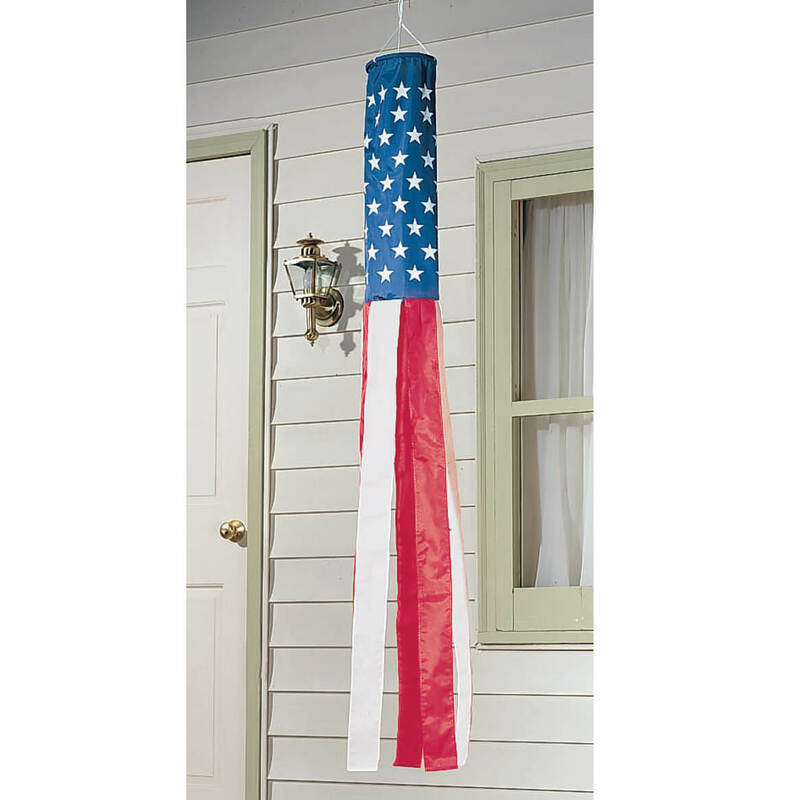 I have already bought a second one, and will continue to purchase this patriotic windsock every time the previous one wears out. I can't wait to hang this in my garden next Spring!! Looks nice hanging from my carport and tells me the direction of the wind?? Love that the streamers on this windsock have sewn/finished edges. Most don't and fall apart in the wind. This one's held up well so far, structurally, and color wise, minimal to no fading thus far. Wish all my seasonal windsocks were made this well. and the price is good too! I live in a very windy state and the spinner hooks seem to wear our fast. This one broke on day one. Maybe there is a "heavy duty" spinner they could use. i've been very pleased with Miles Kimball for years. I hang them on the two sides of my garage door to brighten up the neighborhood. Live in a windy area & these wind socks hold up fairly well. Are reasonably priced. This is the third time I have ordered windsocks from your company. Thanks you for your catalogs. I have in the past ordered other items from you. Always satisfied. we are camping over 4th of July and wanted it to decorate our site. My old one needs to be replaced. We like to fly one on our front porch as an act of patriotism. ALOT CHEEPER THAN ON THE OREGON COAST . flag out front windsock out back !!!! 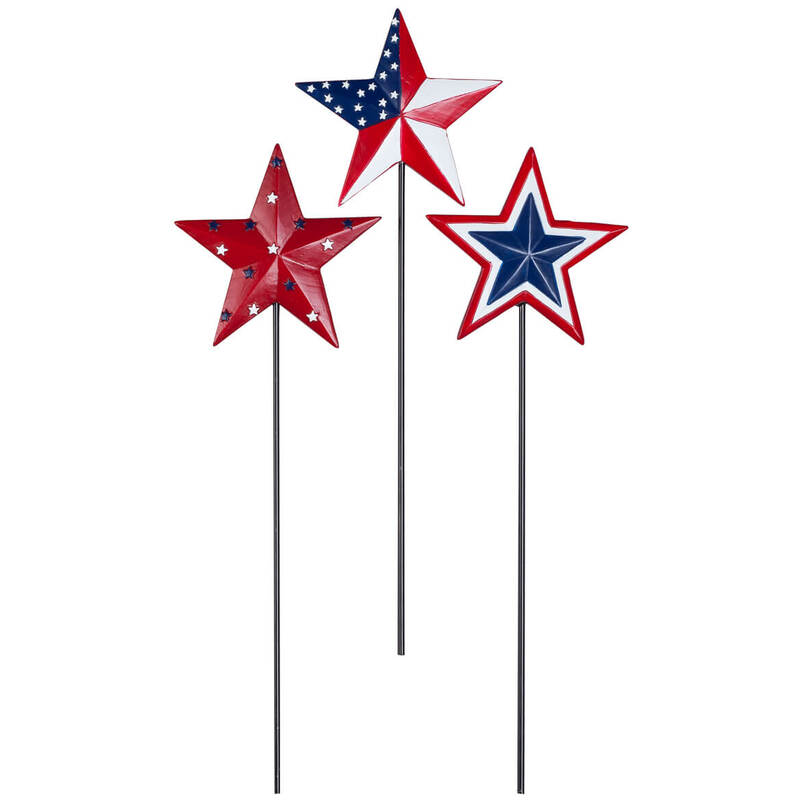 They're beautiful flying in the breeze - a sweet decoration for the 4th of July and Flag day and others. They're easy to hang. And everyone wants to know where I got them -- I always tell them Miles Kimball-of course! Use as a wind sock to see which direction wind is coming from. Love the american flag so I like the smaller windsock/american flag and can be placed in different areas of my front yard. Colorful, outdoor house decoration and keeps birds at bay. We have a very tall pole and this size works great. My Father is in a nursing home and I wanted to give him something to look at outside his window. Couldn't find them anywhere else! We bought this to hang in a tree that is in front of my sisters grave. Good buy, and can buy from home. I enjoy my windsock pole. I just wish they would survive our winds a little better. Because we fly these on the patriotic holidays, and sometimes just "because"!!! We have been purchasing these windsocks for years. We have our south property line marked in 3 spots with the windsocks on a tall pole! We have hard winds and harsh sun here in NM but they last about 4-6 months before needing replaced!! Great price and good quality windsock!! To help celebrate our GREAT country and it's freedoms on the Fourth of July! The only place I can find them and are a good price. Nice addition to the patio of a retired military couple. BEST ANSWER: The label attached to the windsock reads thus: MKC, SKU No. 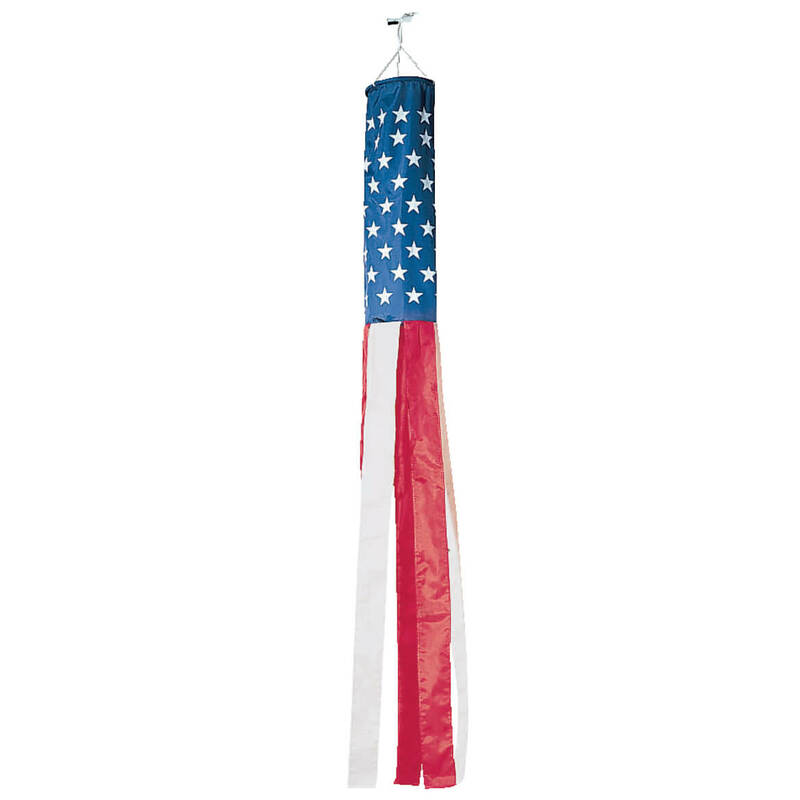 310230, Windsock in USA National Flag, Made in China, UPC 018457 102185. How long is this windsock-Length from top to bottom? BEST ANSWER: Thank you for your question. It is 60" long. We hope this information will be of help to you. Dimensions of the windsock should have been included in description. Duh?? ?